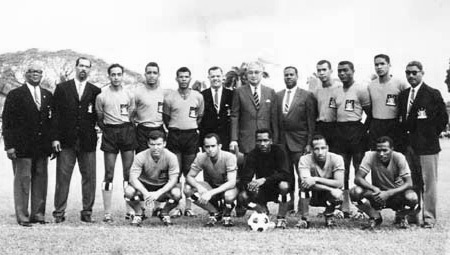 Left to right (back row): Eric James, Conrad Brathwaite, Andy Aleong, Jeffery Gellineau, Alvin Corneal, Ken Galt, Sir Solomon Hochoy, Cyril Austin, Sedley Joseph, Pat Small, Clem Clarke and Sonny Thompson. Front row: Tyrone de la Bastide, Kenny Furlonge, Lincoln Phillips, Doyle Griffith and Aldwyn Ferguson. (vs Suriname).